Anyone know when this will ship? Amazon said Sept 30th. My notice from Amazon today stated "Nov 4 - Dec 18". And yes, if any other vendors have this available I'll gladly order from them and cancel with Amazon. Guys, I don't sell this but I greatly appreciate both your comments which clearly express care for other business's which support our small telescope industry. Thank you both! Daniel I have bought from you in the past, and would buy this book from you, but at the time I pre-ordered it (months ago), Amazon was the only place it was for sale/presale. I didn’t know this was a thing. How many of the 30,000 or so of the objects in iSDA does it cover? "Your pre-order has been released by the publisher and is on its way to our warehouse. Your order will be dispatched from our warehouse soon, and we'll let you know once it's on its way to you." In answer to kidorion the guide covers 2362 of what the authors describe as the coolest objects. Obviously this will be a matter of personal taste and there will be many who disagree with their choices but that is as it is. I do have a review copy so this is not from the blurb. Is there a sale/presale discount for the english version on any site, or is the price the standard regular price? I don't think CUP do sale/pre sale discounts. I think it is just the normal price. No rush to order then. I'm not sure. I normally get the books in boxes from NEAF each year. I'd check their site for promos. The 'buying from amazon' portions of this discussion have been moved to the OTO. Let's keep this thread on topic. It's available from the Book Depository in the UK, free shipping to the US, takes about a week, might be a small foreign transfer fee of a buck or two. Pretty impressed with it. Edited by Dogmeat, 13 November 2018 - 06:12 PM. it is sad to hear that the availability of the Guide is apparently still a problem. It has been released two months ago aund should be readily available from online book retailers by now. We contacted several US telescope dealers for ordering directly from Oculum in Germany with dealer discounts, but no one even replied. If you are owning a business and interested in selling this book, please contact us at info(at)oculum.de for more details. My Amazon order I placed back in September now says: Arriving Nov 21, 2018 - Jan 3, 2019, a six week spread. EDIT: I cancelled my Amazon order and ordered from the Book Depository in the UK. They had just sent me a 10% coupon since I hadn't bought from them in a while, plus they offer free worldwide shipping and the guide is in stock. I cost me about $28 less than thru Amazon for the Field Edition. Edited by rockethead26, 18 November 2018 - 12:14 AM. 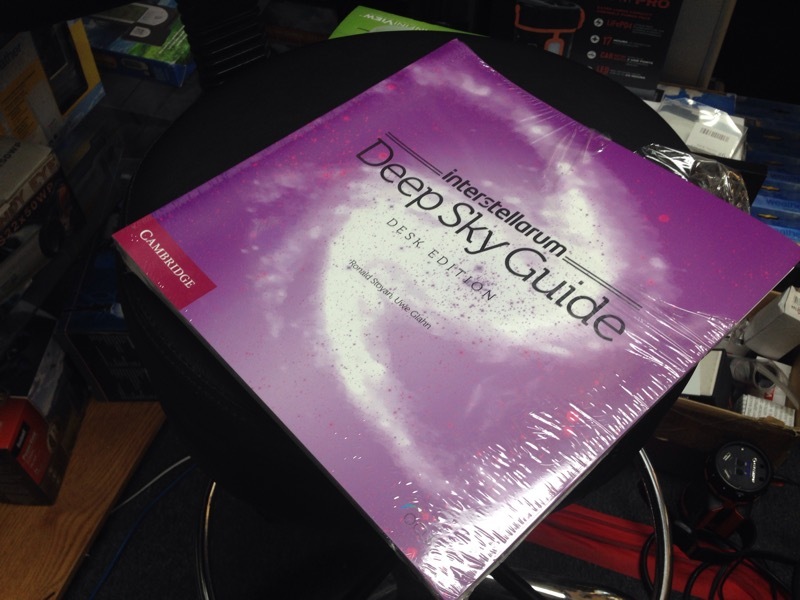 Same here Book Depository gave me a 10% off coupon and I ordered Interstellarium Deep Sky Guide for $85 free shiping. Couldn't justify the double the price plastic field guide. XMAS present from my family to myself - they always get me what I want! If you order the book from Oculum you will get the German edition. You should order it with Cambridge University Press for the English edition. This companion is amazing! Cambridge just sent me a complimentary copy. Thank you Cambridge. "Our shipments to the US (by sea) seem to be taking much longer than before - 8 weeks instead of 5–6 weeks. However, both editions of isDSG have now reached our US warehouse, so are currently available from CUP and will soon be available from Amazon and other third-party vendors." So I very much hope that the wait for many of you is finally over! [...] So I very much hope that the wait for many of you is finally over! Thank you Ronald, I placed my order today for the Desk Edition with Amazon.com and it currently shows “Only 7 left in stock – order soon”. It’s been a long wait for those of us who love collecting and using star atlases, but I’m sure it will be worth every minute! I have the field and desk editions of your Interstellarum Deep Sky Atlas and of course a copy of your masterpiece, the Atlas of the Messier Objects. Thanks a lot for putting so much effort and care into creating this wonderful works! Edited by Castor, 24 November 2018 - 09:41 PM. Edited by clearwaterdave, 25 November 2018 - 04:32 PM.